An ideal treat to add into every Christmas stocking. 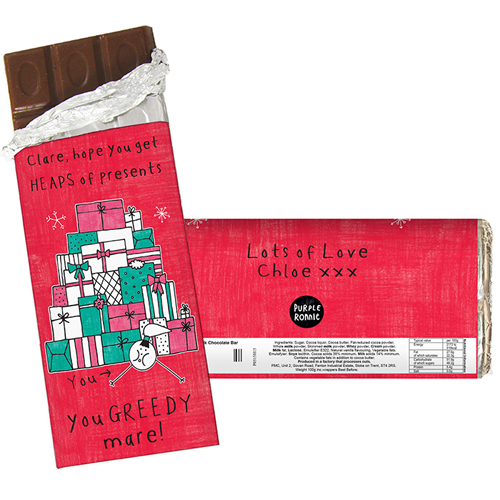 This Purple Ronnie female themed Christmas chocolate bar can be personalised to the front with a message over 4 lines of 25 characters per line and 2 lines of 25 characters on the reverse. © Purple Enterprises Ltd 2013, a Coolabi company Please note - we are unable to support special characters or accented letters, please refrain from entering these within your personalisation. Personalise to the front with a message over 4 lines of 25 characters per line and 2 lines of 25 characters on the reverse.